…It turned out to be a black radish, and I have to admit I wasn’t sure what to do with it. Radishes come in all shapes and sizes from the usual tiny round red ones to much larger, elongated white and black varieties. The flesh inside the black radish is white and is peppery as might be expected. I then found this lovely recipe over on Chocolate and Zucchini, and it turned out to be delicious, with just a couple of small changes. For some reason, I had no garlic in the house, so used red onion instead, which gave a milder, sweeter flavour than would be expected from the garlic. I used rocket from the garden rather than parsley, although I think the parsley would have added a fresher dimension, and I’m no fan of smoked paprika, so used un-smoked, which for my money was much better! Below is the recipe with my changes. Scrub the potatoes (no need to peel them) and cut them into halves. Place them with the onion in a steamer, sprinkle with salt, and steam for 10 minutes, or until the potatoes are just cooked through (the tip of a knife should meet no resistance). Peel the black radish (or, no need to peel it unless the skin is tough) and carve out any crack or hole that may harbor dirt. Grate using the large holes of a box grater. Go through the pile of grated radish and check for any brown bits, which may taste unpleasantly earthy. Place them in a medium salad bowl, sprinkle with salt, toss to coat, and set aside while the potatoes are cooking; the salt will take the edge off the radish. When the potatoes are cooked, set aside to cool until just slightly warm. Chop the steamed onion and add it to the salad bowl. Add the vinegar, oil, and paprika, and toss to combine. Add the potatoes and the herbs to the bowl, sprinkle with pepper, and toss gently to combine. Taste and adjust the seasoning. 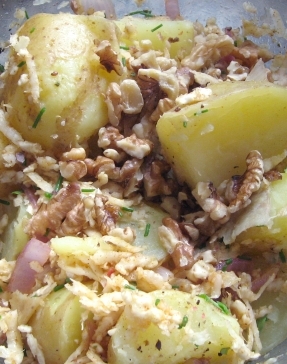 Top with the crumbled walnuts, and serve. The leftovers were great the next day too! I was in an experimental mood the other day and wanted to play around with the veg which had ended up in my fridge! This bake was fun to make, but if it seems complicated there are various ways of shortening the preparation process. Either make extra next time you make a batch of tomato sauce, or use a jar. Also there’s no real need to spread the courgettestrips around the dish, they could be layered like a lasagne instead. It’s already gluten free, and is easy to make vegan. Handful of basil, finely chopped. First make the tomato sauce. Fry the onion and garlic in the olive oil until soft. Add the tomatoes, tomato paste and red wine vinegar and cook for few minuetes to reduce slightly. Add the basil, salt and black pepper. Remove from the heat. Pre heat the oven to 180˚C / 350˚F. In a food processor, grind the cauliflower and walnuts finely. Using a vegetable peeler, make strips of the courgette lengthways. Use the strips to line a casserole dish, leaving some to put on top at the end. 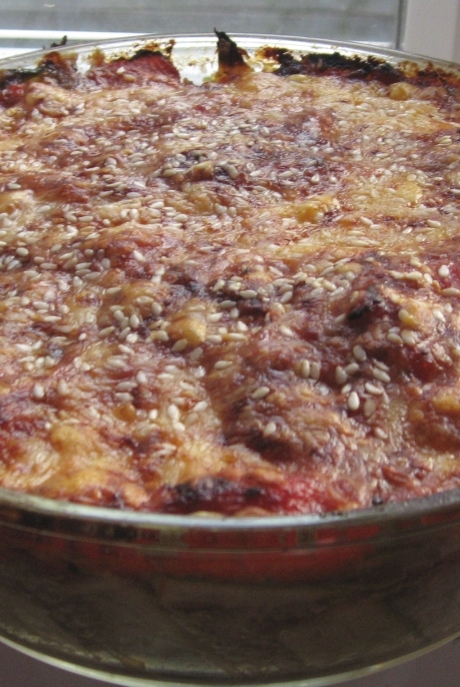 Fill the casserole with the cauliflower and walnut mix. Pour over 2 thirds of the tomato sauce. Top the mixture with the remaining strips of courgette, pour over the remaining tomato sauce, then top with the greated cheese and sesame seeds. Cook the bake for 20 – 30 minutes, or until the top is a rich brown! As we pretend it’s summer here in rain-drenched Britain, I’ve been trying to remember to eat more seasonal salads. Many days it feels like something more warming is required, but actually a salad for lunch still tastes good and leaves you feeling refreshed for the afternoon. This lovely, colourful salad combines the fresh and juicy watermelon with a gorgeously salty feta cheese. It is, of course wonderful eaten outside on a hot sunny day, but also brightens the dullest lunch hour on the those not so great days! Prepare the salad leaves and place in a bowl. 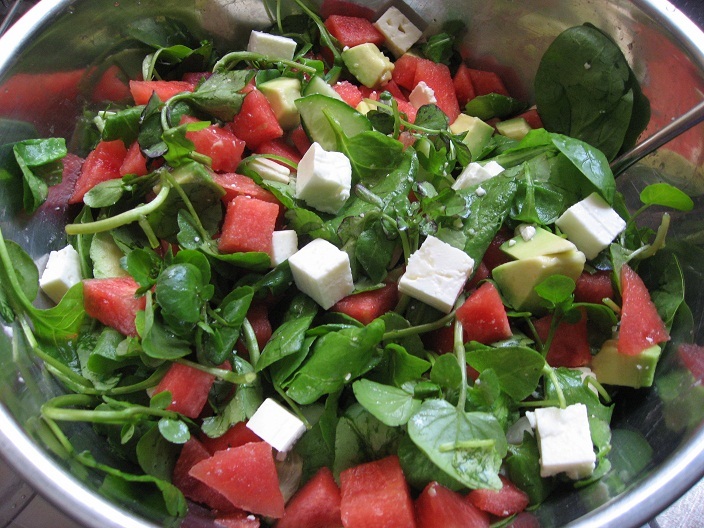 Cut the watermelon and feta into smallish cubes and mix in. Cut the avocado into cubes a short time before serving and toss the salad in the dressing. Just before serving, sprinkle the salad with the roast nuts. Serve the salad with some fresh crusty bread or corn tortilla chips.